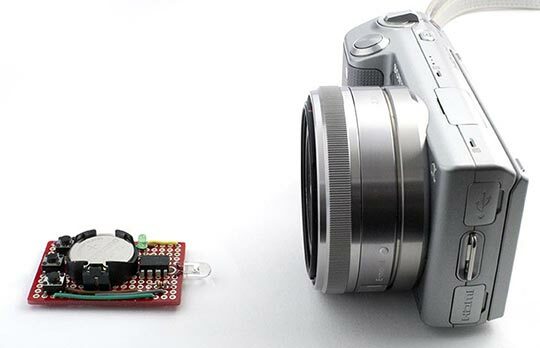 Three-button remote control circuit, for triggering the shutter of a Sony NEX or Alpha camera. It provides three buttons with the following functions (from top to bottom): trigger the shutter immediately, trigger the shutter with a 2-second delay to allow the autofocus to work, and turn on/off video capture. It could be connected to a PIR motion detector to trigger the camera when motion is detected, or to a laser or infrared light beam, to trigger the camera when a beam is broken. It could also be used to trigger the camera at regular intervals, for time-lapse photography. Testing the Sony NEX/Alpha remote control with a Sony NEX-5. To control the camera using the remote control you have to set the Drive Mode to the Remote Cdr. option in the Camera menu. The camera still operates normally in this mode, but the auto sleep function is disabled to ensure that the camera won't go to sleep while waiting for your remote-control command. By analysing the codes from a cheap two-button remote I bought on eBay I discovered that the Sony NEX/Alpha cameras use the Sony SIRC protocol, which is similar to the NEC code, but with different timings. It uses a 20 bit code consisting of a 13 bits address and a 7-bit command code. For a full description of this protocol see San Bergmans's excellent SB-Projects site . A one pulse is twice as long as this. The pulses usually have a mark/space ratio of 1:4, to reduce the current consumption. The above examples show the command 0x2D and the address 0x1E3A used for the Shutter command on the Sony NEX/Alpha cameras. Shutter 0x2D Operates the shutter immediately. 2-Sec 0x37 Operates the shutter after a 2-second focussing delay. Start/Stop 0x48 Starts or stops video recording. The commercial remote control didn't include the video on/off function, which I had to find by exhaustively trying all the possible code options with the camera. The 13-bit address for the NEX/Alpha cameras is 0x1E3A. I've only tested this with the Sony NEX-5 camera, but I believe that all NEX and Alpha cameras use the same remote-control address and commands. The infrared transmitter is based on my IR Remote Control Tool (NEC), but with the transmitter modified for the Sony SIRC encoding system used by the NEX and Alpha cameras. On my prototype the carrier frequency measured 42.2kHz, which is within about 5% of the specified 40kHz. The routines leave Timer/Counter1 free for use by the ATtiny core, for delay(), millis(), and micros(). The quiescent current consumption is just 300nA, which has a negligible effect on the life of the battery. Pressing any of the buttons causes a pin-change interrupt, which wakes the processor from sleep. After transmitting the appropriate code the processor then goes back to sleep. Circuit for the Sony NEX/Alpha three-button remote control. The whole circuit was built on a SparkFun prototyping board  available from Proto-PIC in the UK . It's powered by a 3V lithium button cell. I compiled the program using the Arduino-Tiny core extension to the Arduino IDE . Select the ATtiny85 @ 1 MHz (internal oscillator; BOD disabled) option on the Boards menu and choose Burn Bootloader to set the fuses appropriately using the Tiny AVR Programmer Board; see ATtiny-Based Beginner's Kit. Then upload the program to the ATtiny85. 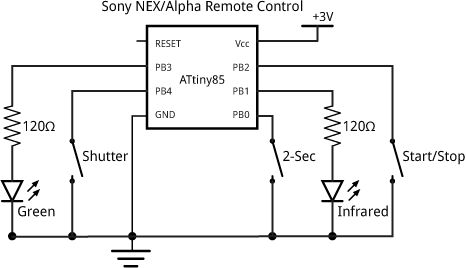 Here's the whole Sony NEX/Alpha Remote Control program: Sony NEX/Alpha Remote Control Program. ^ Sony SIRC Protocol on SB-Projects. ^ SparkFun Solder-able Breadboard Mini on SparkFun. ^ Solder-able Breadboard Mini on Proto-PIC. 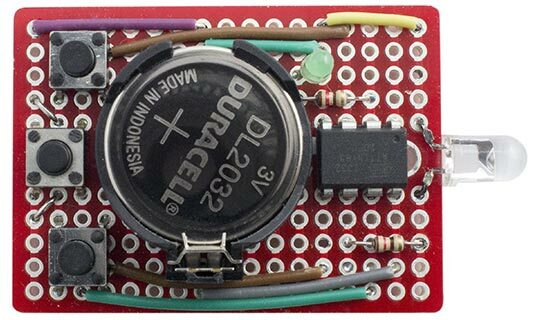 ^ Arduino-Tiny core on Google Code.